Some two years ago, I was listening to a compilation of forró music on YouTube, and one bass line caught my attention. The song was Vem pro meu lounge by Wesley Safadão. Virtually everybody who heard my interest in the song’s bass line, mocked me for it. Apparently Safadão’s music is not held in high regard. But, I was truly impressed that such a rich and improvised bass line could make it into popular music. That could never happen in Europe. Sadly, the original recording I worked with, has been taken down from YouTube. There is a number of live recordings of the song; they all sound quite close, but since Lourinho improvises the bass line, none of them will be an exact match (this one is quite close). I’m not 100% sure who the bass player on this recording is, but it’s probably Guilherme Santana (instagram). The playing style matches closely other videos I’ve found online. The above should work with the online ABC editor. Weekly Sunday jazz brunch with Stella Bass – starts every Sunday at 2pm. Vocals, piano, double bass and drums. Mainstream jazz, they take requests, but they won’t play Led Zeppelin (a friend tried). You’ll have more luck asking for an Ella Fitzgerald, Nina Simone or Roberta Flack song. The venue has superb acoustics. Louis Stewart plays first Wednesday of the month in The House restaurant in Howth. It’s a guitar + double bass duo, sometimes joined by a sax player. It’s the best jazz guitar I heard in Ireland. The Essential Big Band – I saw them when they played in Bleu Note on Capel Street (photo). These days they play in the Grainger’s pub on Malahide road on Mondays. Monday Jazz jam session in The Grand Social – starts at 9pm, runs until midnight. It’s an open stage jam, so anything can happen. Acoustics are so-so. There’s a jazz night in the Bello Bar on Sundays, but I haven’t been there yet. There’s also the Bray Jazz Festival 2014 coming up on the bank holiday weekend in May. UPDATE 2016-08-16: Mercantile is in Bad Bob’s now, Sweeney’s closed, and the jam session is on Mondays. Choir with bass and drums, can it work? I was wondering why some choirs, when touring with two-piece band, go for piano+drums, as opposed to bass+drums. Piano can play bass notes, but the piano+drums setup leaves the overall sound not as full as a dedicated bass instrument. Any choir, when singing á capella, will drop in pitch over the course of a song. Even the brilliant Perpetuum Jazzile . Try playing along to e.g. Mas Que Nada, and you’ll see that they drop at least a semitone. It’s a gradual process over a few minutes, rather hard to spot by an unguided ear. When there’s a piano or guitar playing with the choir, it’ll help the choir hold the pitch. I thought that bass guitar would do that as well. It sounded so good as an idea: you can have a piano trio or a guitar trio, with one main harmonic instrument and a rhythm section. Choir is a type of a harmonic instrument, so all it needs is a rhythm section! Therefore, bass+drums+choir should work great. It turns out, this combination doesn’t work out. The bass guitar does not in practice help the choir hold the pitch. One explanation could be that it’s generally hard to hear the pitch of low notes. I tried to play higher notes, but it still didn’t help. The idea of a choir with a rhythm section doesn’t work. UPDATE 2012-07-24: I got a good effect by playing chords in some parts of the song (somewhere up the neck) and bass notes elsewhere. For instance, I’d play chords in the verse, and bass notes in the chorus. It was effective. I noticed that there aren’t any good Google Search results for “The World Is Saved chords”, so I wrote them down. 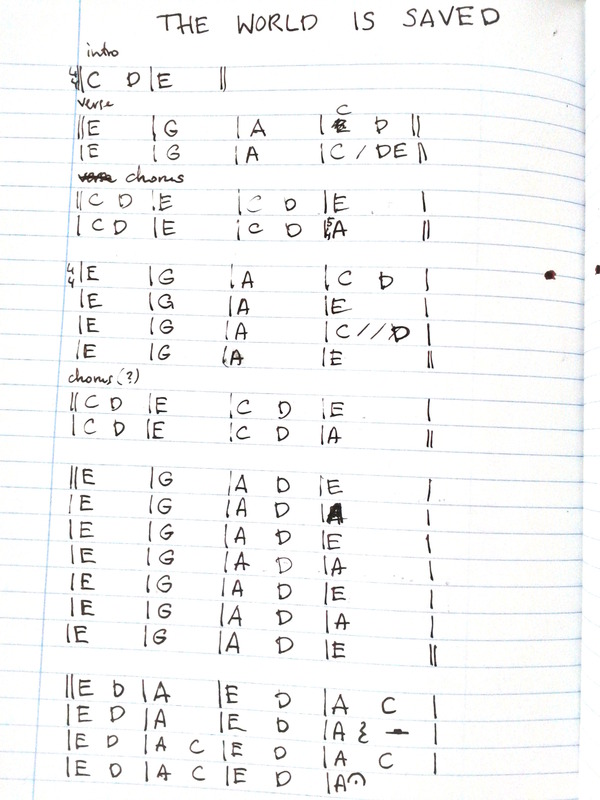 All the chords are major; there isn’t a single minor chord in this song! The meter is 12/8 at about 76 bpm (beats per minute, one beat is three eights). Can small events influence our lives at large? It was spring 2000, in Warsaw, Poland. My band, whose members were professional level musicians, featured two vocals, a brass section and the basic quartet: drums, bass, piano, and guitar. Gigs were rather difficult to find, but the band played live every now and then. There was not enough work for the band to live, but too much for it to die. Considering the size of the band, and the relatively unpopular, at the time, music genre — acid jazz — it’s no wonder that gigs were difficult to get. I was continuously working on music arrangements. The band had a brass section (trumpet and trombone, sometimes also a sax), so I was adding brass section parts to every song. It felt great to work on them, and experience the new air of songs boosted by the brass section. The band played mostly covers, with the objective to have enough material to play gigs. In the meantime, I was working on original songs. While we already had five of them, getting new ones was a priority. We needed enough songs to record an EP. This is where the fateful ‘single event’ comes up. We had a gig in a club, preceded by a rehearsal in the morning, as usual. I had just printed all parts for a new song, and was very excited about rehearsing the best song I ever wrote. We started the rehearsal by playing a few songs as a warm-up. Everything went fine. After the warm up, I handed out the parts of the new song. Band members studied the sheets for a while, and eventually nodded that they’re ready. I counted in, slowly, and the band started playing. Intro. First verse. It sounded great. Suddenly, something went wrong: one person missed a beat, another hit a wrong note. Whatever it was, the music stopped. It’s a normal occurrence at rehearsals. I thought nothing of it, and was just about to count in again, when somebody said that they don’t want to rehearse the song anymore. ‘Me too’, added somebody else. I looked around. People were looking at the floor, avoiding eye contact. They didn’t want to play it. I still wanted to rehearse this song, but it was no use to push for it. The rehearsal ended. Excitement turned into frustration. Rehearsals continued, but the band never rehearsed this song again. Nobody asked about any new songs. I stopped writing brass sections, and stopped composing originals. The band got a few more gigs, but I had no motivation to drive it anymore. Wanting to get some rest from the band, I bought a book about programming and spent my vacation studying it. In the autumn, I applied for an undergraduate course in Computer Science, and my music career ended. Was really the unfortunate rehearsal the beginning of the end of my band? Or would the band collapse anyway? It seems like a stupid question, unless I realize that it changed my life completely. Since upgrade to Ubuntu 6.06 (Dapper Drake) on my Amilo Pro V2000D, the sound doesn’t block anymore. It’s nice that all the applications can use the sound at the same time, even after switching the user — the other session is able to use the sound as well. There is one thing that got worse after the upgrade: the sound skips sometimes. While listening to the musisc, it sometimes suddenly skips few seconds of the music. This is annoying, because then the music misses the beat and it’s destroying the pleasure of listening. I noticed that it always (I think…) happens in the same moment: about 3 minutes 40 seconds of the song. UPDATE: I think it’s more like 3:38. And it’s not ALSA, it Rhythmbox 0.9.5 that does that. I listened to Barumba for many years now and I love it. However, the newer (2002) song “Stone Cold Heart” fits very well with the loop, and I appreciate the perfection of Incognito’s arrangements, sound and mixing.